The yellow segment represents an obstacle in the vehicle’s path. The red segment represents an obstacle located in the vehicle’s collision area. The grey segment represents an obstacle outside of the vehicle's path. Front vehicle path display Forward gear engaged. OR: move the gear lever to neutral, or move the selector lever to N.
OR: depending on the vehicle equipment level, roll forwards. Rear vehicle path display Select reverse gear or move the selector lever to position R.
OR: depending on the vehicle equipment level, roll backwards. The vehicle path display changes in relation to the steering input. Obstacles that are located in the vehicle's path during a steering input are displayed in yellow and red segments. The segments are shown in red when the distance to an obstacle is less than approximately 30 cm. The segments are shown in grey when the distance to an obstacle is greater than approximately 30 cm. 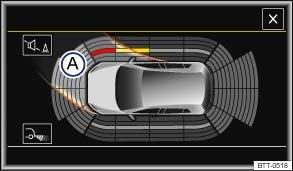 All segments are displayed in grey and the vehicle path display is hidden when the electronic parking brake is closed. All segments are displayed in grey and the vehicle path display is hidden when the selector lever is in position P and the ParkPilot is activated. The vehicle path display is not shown when towing a trailer. If an ultrasound sensor fails, the vehicle path display is switched off and cannot be reactivated until the fault has been rectified. The segments are no longer displayed in relation to the steering input and the vehicle path display is hidden. 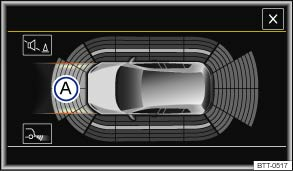 a) The area around the vehicle is not shown in vehicles with 4 ultrasound sensors in each bumper, front or rear.